In today’s growing transit market, efficiency and safety are priorities in every aspect of our business decisions. By using advanced software and integrating communication equipment, we are able to create safer environments for both passengers and pedestrians, and create a distraction-free and reliable work environment for operators, maintenance, and directors. Intelligent Transportation Systems (ITS) provide agencies with real-time GPS tracking and communication by connecting on-board devices with central management, bus station information systems, and even with the devices in passengers’ hands. One central Mobile Data Terminal (MDT) is then capable of monitoring and operating voice announcements, next stop requests, fare-box collection units, automated passenger counting, and more. 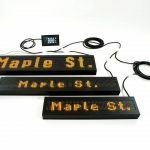 LED Destination Signs, such as the Transign LED Destinator™ or Transign LED EnCompass™, information can be displayed automatically based on bus location or other on-board activity. Exterior facing signs will trigger their next destination based on geo-fence GPS data, and can display emergency alerts or other localized information. Interior facing signs integrate directly with Automated Voice Announcements (AVA) to announce next stops for full ADA compliance and improved communication with passengers. Interior monitors and LCD displays can further enhance communication with video playback and location-based advertising opportunities. LED Destination Signs are also commonly used in conjunction with bus station information systems, seamlessly tying together on-board communication with any waiting customers. The GPS location technology of a fully integrated ITS can send real-time data, including arrival time, weather and emergency alerts, or route changes. Smartphone applications can receive the same live notifications to assist passengers with route and trip planning. By combining multiple solutions into one single platform, reliable and automated information can be shared with an entire customer base simultaneously. When connected to a cellular 3G network or cloud, the advanced features of Transign LED EnCompass™ act as an Integrated Fleet Management system by delivering reporting and receiving incoming data feeds. In addition to increased efficiency, the detailed reporting and passenger counting provide valuable market information such as ridership peak stops and times to assist in marketing and route planning. Critical vehicle performance, including fault codes and maintenance alerts, can also be monitored and reported instantly. Having this critical information allows for more efficient maintenance procedures and can help reduce management’s safety and security concerns by making real-time informed decisions. To further improve safety and security, all of Transign’s LED Destinator™ and EnCompass™ signs and controllers combine with emergency button or panic switch functions. Basic emergency buttons are discretely placed within the driver’s reach, allowing them to change the outward-facing message to read “CONTACT POLICE” or “DIAL 911” on all LED destination signs. Further integration with advanced features can also communicate emergency messages and alerts back to dispatch, can trigger special recording devices, or can even alert waiting passengers via bus station information systems or alarms. A fully integrated or “connected” bus network utilizes the above GPS feeds, monitoring systems, and emergency systems to utilize resources in the most efficient and safe way possible. By reducing human error and distraction, we also effectively eliminate unnecessary maintenance deployments, safety concerns, and communication issues. 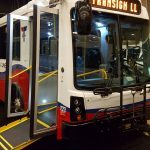 Incorporating interior and exterior LED Destination signs and voice announcements ensures safe, reliable communication for much more than just routes and stops. Integrated bus shelter information systems and LED destination signs can alert passengers to safety information, can enhance marketing and public relations communication, and integrate with route planning smartphone applications. 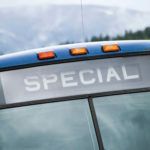 Safety and efficiency: no two things will do more to increase ridership or positively impact bottom-line operational budgets, and there is no better way to accomplish this than a fully integrated fleet. Transign’s LED Destinator™ and LED EnCompass™ packages offer unrivaled integration options and non-subscription based GPS options with many upgradable features.